Narango, who is working with Doug Tallamy, professor of entomology in UD's Department of Entomology and Wildlife Ecology, is also associated with the Smithsonian Migratory Bird Center and works through a citizen-science program called "Neighborhood Nest Watch." Narango is co-advised by Pete Marra, director of the Smithsonian Migratory Bird Center. "We focus on woody plants—so trees and shrubs—and we've documented over 375 different species in these 203 yards. Which is crazy," said Narango who added that it became apparent quickly that some trees are better than others with regard to sustaining food webs. 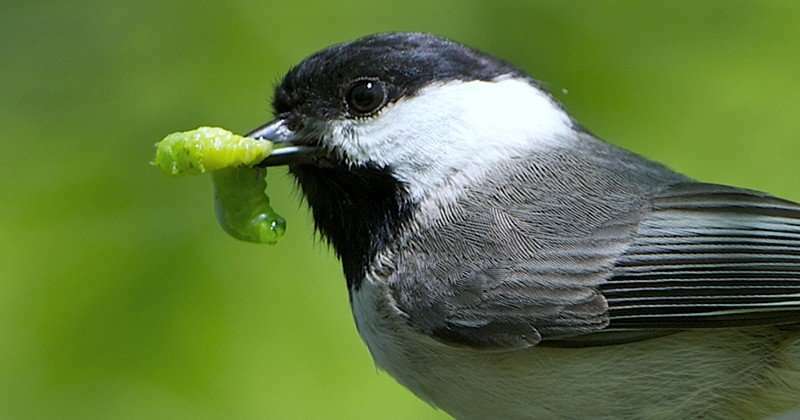 "We just had a paper come out in the journal of Biological Conservation where we show that native trees are better at providing caterpillars for birds, which is a really important food resource," said Narango. "Native trees are better, hands down, but even among the native trees, there are some that are better than others so things like oaks and cherries and elms are highly productive for caterpillars, so they have lots of good food for the birds." Narango added that there are a lot of non-native plants—such as zelkova, ginkgo and lilac—that don't provide any resources for breeding birds. "Those species are true non-natives so they're not related to anything here, and they provide almost nothing in terms of caterpillars for birds," said Narango. "There are also species like Japanese cherry and Japanese maple that are non-native but are related to our native maples and cherries. We found that those species have an average of 40 percent fewer caterpillars than the native versions of that tree. If you had a choice between a black cherry and a Japanese cherry and if you're interested in food for birds, then you should choose the native version." Narango said that a problem homeowners may face when trying to select native versions of plants is that a lot of the big box stores don't carry them. "There are a lot of really great small nurseries that have many native plants that are productive in terms of caterpillars and are also very beautiful," said Narango. "You definitely don't have to sacrifice beauty to get plants that are ecologically beneficial. There's a lot to choose from so you can have beauty, you can have fruit and then also have food for birds, too. It's all interconnected." 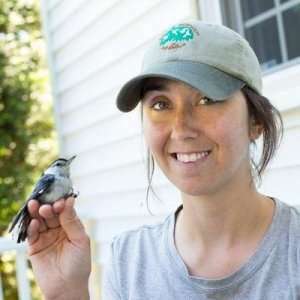 As for the most eye-opening aspect of her research, Narango said that it has to be the tremendous amount of diversity in bugs and birds in people's backyards. "A lot of people think you need to go to the woods to see beautiful butterflies or beautiful birds, but they're actually in people's backyards, too," said Narango. In the group's bird surveys, they documented 98 different bird species. "When these birds would choose a tree, all the other birds in the neighborhood were choosing those trees, too. So we would see these amazing warblers that don't breed in Delaware or in D.C. but are migrating through, and they're using all these suburban habitats on their way north. In a way, our chickadees were telling us what all of the birds want during that period," said Narango. "I planted this flower called ironweed, and the first year it was there, I had the specialist bees that use that flower and then I have caterpillars in my shrubs, and it's really cool how quickly you can see life be attracted to your yard when you plant the right species," she said.